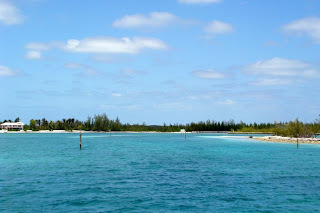 Treasure Cay in the Abacos is indeed a treasure. 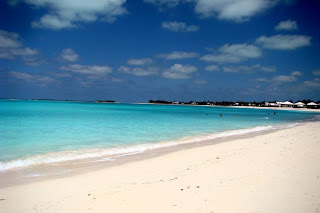 UNLESS you don't enjoy walking on one of the top 10 beaches in the world (previously chosen by National Geographic), or you don't find security in a great harbor that offers good holding and 360-degree protection, or you aren't looking for one of the least expensive and relaxing locations in the Bahamas. Yes, I did say least expensive because we have found Treasure Cay to be the best deal in our Bahamas trip so far, and for several good reasons. 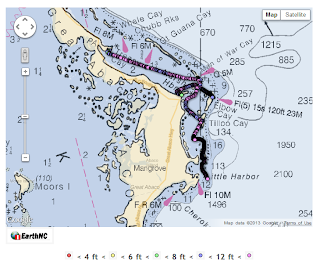 The entrance to Treasure Cay is well-marked and deep, but care needs to be taken to stay in the channel when entering. The first thing we noticed is the easy-to-reach fuel dock right on the wall after entering the channel. This is not only a fuel dock for boats, but a service station for cars on the island. 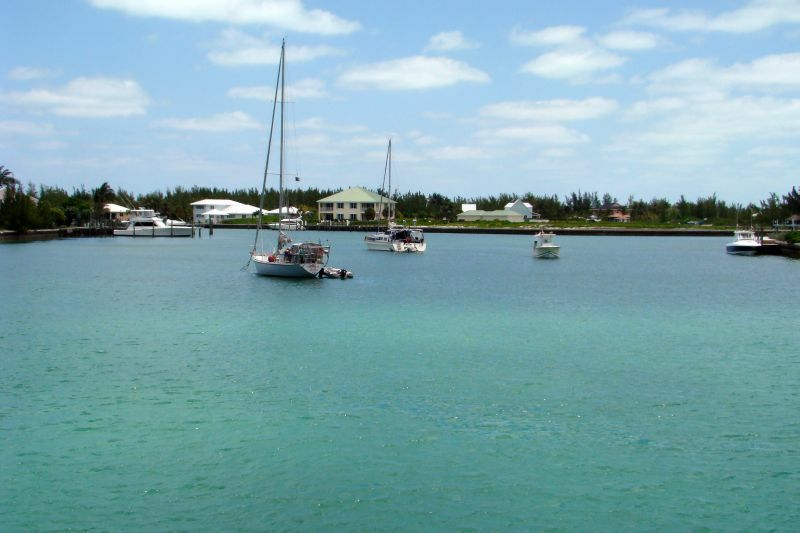 Once inside this man-made harbor, there is ample anchoring room and deep water throughout the harbor. Many very nice homes and condos ring the perimeter, and if you continue farther inside, there is a very nice marina. The guides all refer to moorings in the harbor, but there is only one and it is occupied by a semi-permanent resident. We dropped the hook in 7 feet and it set immediately. There were already several boats of all sizes and configurations spread out around the anchorage. A sign along the wall as you come in instructs everyone to register with the marina. 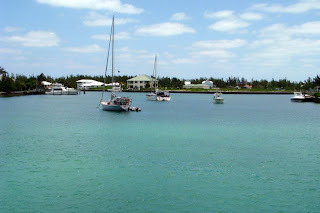 Once we were confident that the anchor was set and all was well, the dinghy was splashed and we headed into the marina. We stopped in at the office to notify them that we were anchored and would be in the harbor for a couple of days. 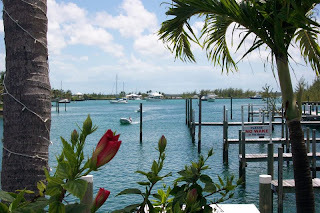 Unlike many stops in the Bahamas, they were not concerned with collecting any money and told us there was a $10.00 per day fee, even for anchoring, but for that $10.00 per day, we would have complete use of the marina facilities. That included landing the dinghy, use of the heads and showers and the marina pool, which is very nice. The marina provides trash receptacles on the docks for trash and boaters can fill their water tank or jugs at the dock with no extra charge. We almost asked if they we were hearing correctly, but decided not to press the issue. The marina also offers free Wifi, a rarity in the Bahamas, and we were given the password for the Wifi without ever handing over a dime. The Dockmaster said we should settle up whenever we were ready to leave, and did not ask for any information about our boat. This was indeed a rare and pleasant experience. We found everyone to be friendly and helpful. There is a good restaurant across the street from the marina that is open for lunch and dinner, and the restaurant at the marina is open for breakfast and dinner. At the marina pool, there is a bar that doesn't open until 5:00 pm, but they usually have ESPN or news on the outside TVs during the day. A block down the street is a small shopping center with a dive shop, golf cart rentals, a mini-mart, BTC office, a canvas shop and a larger, well-stocked grocery store. If golf is your thing, there is a 5-star course nearby. And then there's the beach...and oh what a beach. It is over 3 miles of the most incredible colors of sand and water we have seen for a very long time. Near Coco Beach Bar, there are lounge chairs under umbrellas or thatched roofs for use of marina or the beach bar customers. Our lunch at the beach bar was pretty good. Needless to say, we spent a lot of hours just walking the beach and soaking up the scenery and sun. 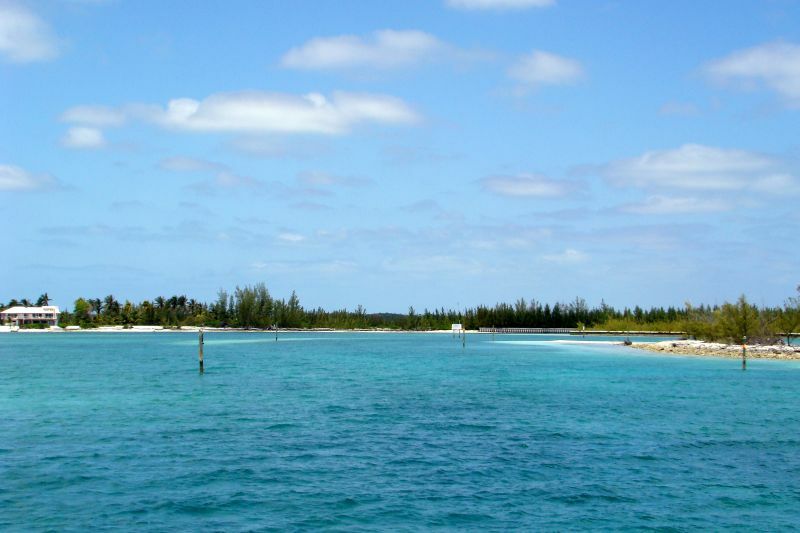 We highly recommend the Treasure Cay anchorage as a must-do for anyone cruising the Abacos. As an aside, we had something unusual happen as we entered the harbor. We heard an announcement on the VHF about a happy hour, but since we were negotiating a new harbor entrance, we didn't pay too much attention. 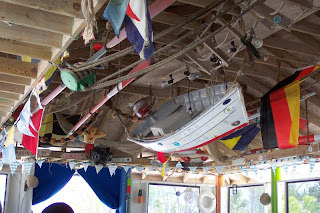 Many restaurants in the Bahamas announce specials and advertise over the VHF all day, so we didn't think much of it. After we were anchored and had splashed the dinghy, we stopped by another boat we knew from Marathon and Marsh Harbor. They informed us that it wasn't a restaurant, but another boat in the harbor that was inviting everyone over to their boat that evening for drinks and hors d'oeuvres. Several boaters showed up that evening and we made new acquaintances. These are the special moments that we remember most about our cruising adventures - the kindness and generosity of strangers who become friends. For many more photos of our Bahamas adventures, visit our Facebook page here. Very informative and positive. We're about a year behind you. Thanks and good luck. We hope everything works out for you and we're happy you enjoy the blog. 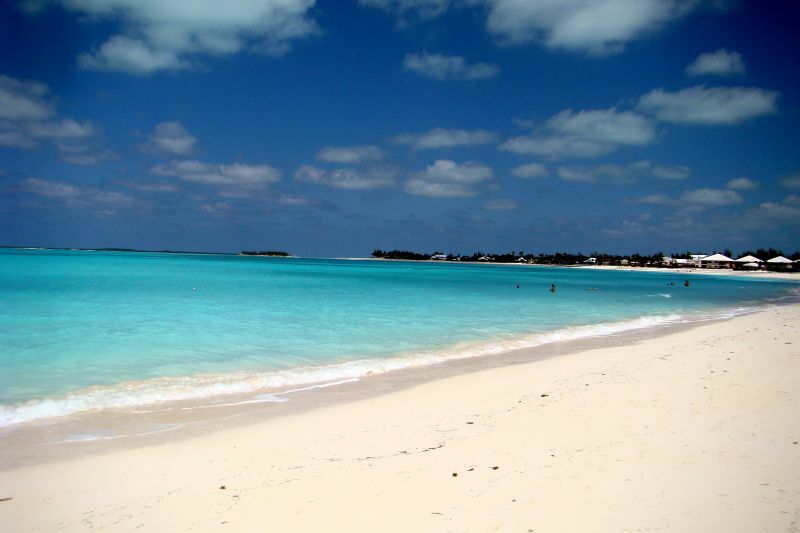 I think Treasure Cay will be our next stop. We are across the way at Green Turtle Cay right now (Black Sound). We plan to stay at least until this weekend with the Heritage Festival. Iris, We plan to try Don't Rock Passage on Tuesday if the wind and seas lay down a bit. Otherwise, we will be in Green Turtle on Wednesday. Hope there is some room. I'm interested in hearing about Don't Rock Passage. We are currently tied to the dock at Donny's Boat Rentals in Black Sound. At the moment (Tuesday at noon), there is some room to anchor at the end of Black Sound. A couple of Moorings charter cats left this morning. All of Donny's moorings are taken, but there might be others. Don't know if you're interested in one of the sounds or anchoring outside. Black Sound is nice because it's a short walk into town. Hope to meet up with you guys. Iris, We have decided to stay at Treasure Cay one more day and should be in Green Turtle tomorrow afternoon. We will try and pick up a mooring if one is open, or anchor. We'll see what it looks like when we get there. Look forward to meeting. We enjoy these post, very good information. We were wondering if you guys have any info on volunteer opportunities in or near Treasure Cay?